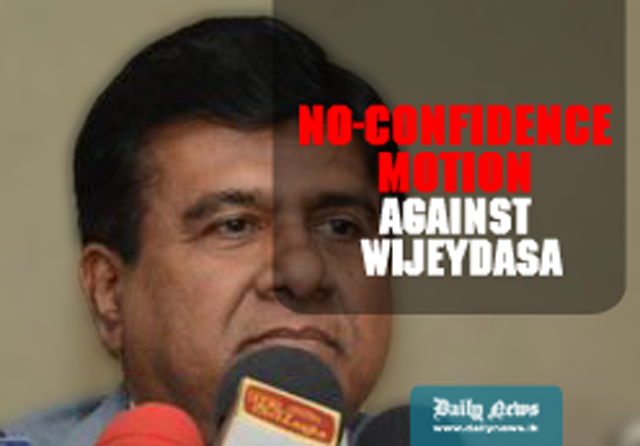 The Working Committee of the United National Party (UNP) and its parliamentary group today unanimously adopted a resolution stating they do not have confidence in the conduct of Justice and Buddhasasana Minister Wijeydasa Rajapakshe. The resolution submitted by parliamentarian Ashu Marasinghe and seconded by parliamentarian Sydney Jayarathne comprised 5 points. During deliberations - which lasted for close to two hours at Sirikotha today - Minister Wijeydasa is reported to have said that he did not make the statement to the effect that “I will not look back without taking control of the Hambantota port”. Following the presenting of the resolution, Prime Minister Ranil Wickremesinghe had asked those present if any member present opposed it. No member had opposed the resolution. The resolution containing five points said that, Minister Rajapakshe had failed in his duties as the Minister of Justice; the Minister had failed to bring in new laws to tackle bribery and corruption as promised by the United National Fronts manifesto; that the Minister had failed to bring in laws which provide for criminally earned moneys to be given back to the agencies; that the Minister is being blamed for the prolonged delay in the hearing of criminal cases; and that the Minister conduct had brought the government and the United National Party into disrepute. Minister Rajapakshe who was present during the deliberations had said that he had not made the purported statement to the newspaper. He was given time until August 21st to clarify his statement. Rajapakshe was asked to obtain the advice of Ministers Malik Samarawickrema, Mangala Samaraweera and Ravindra Samaraweera in this regard. Responding to the delays in prosecution, Minister Rajapakshe had said that despite the assertions by parliamentarians, he could not interfere with the work of the Attorney General’s Department. AFTER RAVI KARUNANAYAKE, NOW YOU ARE ALL ARE CHASING BEHIND Dr. WIJEYDASA – MINISTER OF JUSTICE AND BUDDHA SASANA ( A PATRIOT) WITH STUPID ALLEGATIONS. WHAT ABOUT THE OTHER CABINET MINISTERS AGAINST WHOM SUBSTANTIATIVE CORRUPTION COMPLAINTS HAVE BEEN MADE? TWO OF THE MOST WANTED MINISTERS FOR SUCH CORRUPTION ARE, A MINORITY COMMUNITY POLITICAL PARTY LEADER FROM THE NORTH WHO IS ALLEGED TO HAVE SWINDLED MILLIONS OF RUPEES IN TRADE DEALS AND PAYMENTS FROM THE ROAD DEVELOPMENT AUTHORITY AND THE OTHER IS A MINISTER WHO IS A CLOSE ASSOCIATE OF DR. NEVILLE FERNANDO. THE PRESIDENT SHOULD BE BOLD ENOUGH TO BRING THEM TO BOOK TOO. IF THE COMPLAINTS AGAINST THEM IS PROBED, MANY EVIDENCES WILL WE REVEALED TO THE CID AND THE PRESIDENTS COMMISSION. Noor Nizam - Political Communication Researcher, Former SLFP District Organizer Trincomalee District and Stalwart and Convener - "The Muslim Voice".